Eofficehub will scan your pages, paper, medical records, files, charts and documents for 1/2 (half) a cent. Call for monthly service or per box rates. That's right! $.005 per image. Guaranteed lowest price in Atlanta or the state of Georgia. We'll include everything your documents need for one simple price. Automatically scanning and sorting pages up to 8" X 14"
Charts/files can have multiple electronic images files output sorted by notes, correspondences, labs, etc. 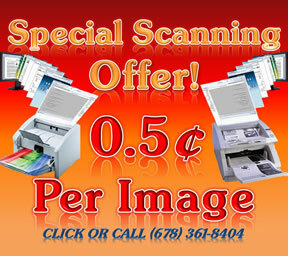 Scanned files can be faxed, imported into EMR's, printed or emailed directly from the disk that we send you. We guarantee 100% quality on each project. Offer subject to some restrictions.